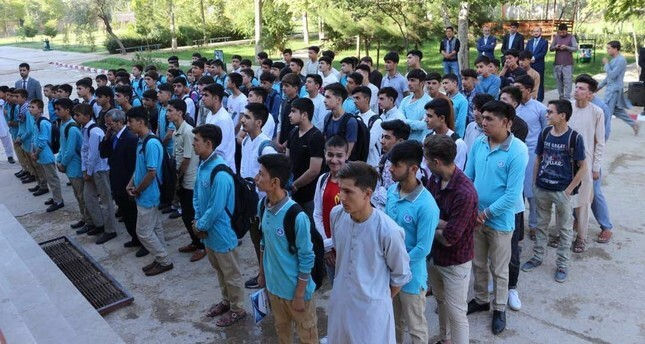 Hundreds of Afghan students at schools run by the Turkish state-run education body have started the new term. The Turkish Maarif Foundation (TMV) took over two high schools linked to the Gülenist Terror Group (FETÖ) in the northern Afghan city of Sheberghan. An opening ceremony was held in the city earlier this week with attendance by the foundation's officials, principals, teachers and Afghan officials. The high schools, together with two dormitories, started operating this year, Birol Akgün, head of the foundation, said. A high-quality education will be given to students by the foundation, Akgün said. "A total of 470 students have enrolled," he said. "Afghan people showed great interest in Turkey's Maarif Foundation and they will continue enrolling their children to these schools." Twelve schools and three private teaching institutions in the country were handed over to the Maarif Foundation. The move came after a memorandum of understanding was signed between Turkey and Afghanistan this February. Turkey established the Maarif Foundation in 2016 to take over the administration of overseas schools linked to FETÖ. FETO and its U.S.-based leader Fetullah Gülen orchestrated the July 15 coup attempt, which left 250 people dead and nearly 2,200 injured. Ankara also accuses FETO of being behind a long-running campaign to overthrow the state through the infiltration of Turkish institutions, including the military, police, judiciary and schools.